DOG PHOBIAS, FEARS, ANXIETIES, OH MY! If your dog behaves anxiously or is fearful during fireworks, thunder, or any loud noise. OR shows fear of a person, place or thing? There are a few things you should be doing with your dog (or not doing) before, during and after whatever it is that’s causing your dog to feel that way. Although you don’t “comfort” them, you wouldn’t walk away or ignore them either. 2. (cats too) Use desensitization techniques, by exposing them to the negative noise, person or object in very small increments, i.e. the noise should be barely audible, and object should be far away. To help control noise, find pre-recorded noises eg thunder or fireworks, on the Internet or YouTube. 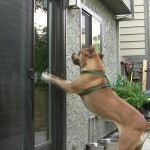 For objects, position yourself far enough away, just outside of your dogs threshold, where there is little or no reaction to what triggers the fear. Practice as many short sessions over days or weeks, each session have the noise volume increase and the distance to the object decrease. 5. Obedience Training (probably the most important) It is an “indirect” but effective way to help cure phobias and other behavioral problems. Your dog should understand at least 5 basic on and off leash around distractions. Just by teaching a dog to sit, stay, lay down and come on and off leash, I just happened to cure a dog of it’s noise phobia. When taught correctly, obedience training is fun, helps build a dogs confidence, builds a better more trusting relationship, and actually makes them smarter to learn other new things faster. 6. It always helps to turn on the television, washer, dryer (place a few tennis balls with no heat), a fan, etc. Have these things going during the fireworks. 7. Sometimes “crating” your dog during the episode (or while you’re away to minimise escaping) can be helpful, but FIRST, your dog must be very well adjusted to their crate. Look for my video tutorial on ‘crate training’ on my YouTube channel. 8. If you know approx when the scary event is going to happen, make sure hours or days before the event bring/keep your cats indoors, so they don’t get caught outside only having to face the fear on their own. Warning: Don’t use Laser Pointers! Using Laser pointers or flash-lights as a chase game for dogs (and some cats), can ‘literally’ drive them crazy, with lifelong consequences. Please don’t use them. Sure, to us it looks like fun, like the dog is having a good time chasing the light, but just after only a few times exposed to this game, they can easily develop an obsessive-compulsive disorder to light or any shade or flicker of light. Trust me, you don’t want your dog, in every waking moment, constantly staring, drooling and/or lunging at some flicker of light, reflection or shadow on the ground or wall. I’ve seen dogs like this and it’s very-very sad. Dogs need to periodically “get paid” when they chase things, physically touching something with their body or mouth. If they don’t, they can become hypersensitive or obsessed over it. (like how they are with mail carriers or people walking on the other side of a fence) This is why this game is so damaging, no physical touch to light, along with a dogs natural ‘prey drive’ to chase moving things. Some dogs are more susceptible to develop this disorder than others, but you don’t want to test your dog to find out. Having the light come across some treat or toy is not a good idea either because you’re still encouraging them to chase the light. There is ‘light’ (excuse the pun) at the end of the tunnel for dogs with this obsession. Consult a reward/science based trainer to learn the counter-conditioning techniques. Do you have a dog with this obsession? Chewing is a normal dog behavior, and as you’ll see from this list, chewing is driven by many things. It’s important to understand why your dog chews. You may or may not know, you have a huge influence of what a dog chews on and how long the chewing lasts. You can keep destructive chewing to a minimum with proper exercise, training and redirection techniques. 1. Testing: What else are the items around your home for anyway? it’s a table to you, but to your dog, it’s wood. 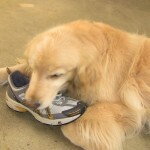 Throughout your dog’s life they may test items by chewing them to see if something good comes of it. 2. Teething: Around 2 months old when their milk (puppy) teeth are coming in, and between 4-6 months (start of the destructive stage) as the milk teeth fall out and are replaced by the adult teeth. Puppies must instinctively chew to help their teeth go through this process. It also helps relieve tenderness of the teeth and gums. 3. Keeps gums & teeth, clean & strong: Humans brush, dogs chew. 4. Responsibility: As your puppy goes through the teenage months, approximately 6 months to a year, they must chew because instinct tell them they may need to go hunt for food, protect family members or themselves. 5. Exercises jaw muscles: We go to the gym, dogs chew. Around 7-8 months old is the height of the “destructive stage” for chewing. Chewing can last for months, even years, if modification or redirection techniques aren’t used. 6. Anxiety, tension or comfort: Chewing helps relieve a dog of tension or anxiety. Some dogs carry items in their mouth to help comfort them. 7. Boredom: A lonely or bored dog will be more destructive and chew for longer periods of time. 9. Smells good, tastes good, feels good, or they may just be hungry and want to chew on something. 10. An obsession: Dogs can develop obsessive chewing disorders . If you wanted to add something, leave a comment below. Top Ten regrets for dog owners. There are certain behaviors or tricks that you think are cute, and you’d like your puppy to do, but once you allow your puppy to do that behaviour, you may soon have regrets. 12. Teaching / encouraging your dog to be ball crazy.Yes I know it’s important for dogs to have toys to play with; toys satisfy the many needs dogs have. The problem is, if there is too much ball playing, these ball-obsessed dogs start to develop poor social skills with other dogs – becoming anti-social, even aggressive if another dog gets near their toy or ball. Not to mention the lack of control you’ll have when all they want is the ball. —It’s a lose-lose situation for many dogs, especially the breeds that are practically born with a ball in their mouth, meaning it takes no effort -on your part- to teach them to bring back whatever it is you throw. So while you’re throwing the ball over and over, these dogs are missing out on proper dog-to-dog interaction and are most susceptible of becoming anti-social. —If from an early age your dog shows a natural desire to chase balls, this is not what you should do all the time, you should spend most of your time encouraging them to play with other dogs; you (and your dog) will be much happier you did. 1. Teaching a puppy to shake paws at an early age. This is a VERY simple behavior to teach, but once you start encouraging the behavior, it will be difficult to stop. When the puppy is 8 – 10 months (or older) – is a better time to teach this. The rule is, if you don’t ask for their paw, you should never take hold of it. If you do, be prepared to get your leg, arm or even face scratched. I’m never impressed if a dog gives their paw; but I am impressed if they don’t. 2. Jumping on you….Same thing here, easy to teach- hard to stop once it’s ingrained. If you have a new puppy, teach them “Sit” for attention, or turn them sideways or face them away from you before picking them up. As they get older, you can teach them when they can jump, and who or what they can jump on. 3. Giving your dog food from the dinner table, or giving too many treats without asking them to do something for you. If you give a dog food from the dining table, your dog will start expecting food from you or others at the table. Ask your dog to respond to a command before giving them treats, and try to make it challenging, a “sit” near the kitchen area, is nothing to be impressed by (sorry), try it when a guest comes by or another dog walks by, now I’m impressed. It’s also a good idea not to give strange dogs food without the dog owners permission. Chewing the wrong household items. Only allow your dog to play with dog type toys, especially if you have a puppy or older dogs with chewing problems. Dogs cant distinguish between new or old, theirs or your Child’s toys. Just before a walk, people get they’re dog all excited and say“Ya wanna go for a walk“? I’m not sure why people do this, but they do. Allowing a puppy to carry his leash around. A dog should understand the leash is an extension of your arm, you don’t want a puppy to disrespect the leash. 4. Allowing a dog to sleep with you in bed. Yes, dogs are highly social creatures, but the reality is you’re not always going to be available 24/7 as your dog would like. Letting them sleep in bed in the first year of their life is a false sense of attachment, this can lead to separation, control or aggressive issues. They should have their own sleeping spot, preferably next to your bed. When they’re older puppies, You can give them permission to jump up for cuddles. Don’t forget to teach them to jump “Off” the bed. 5. Allowing or encouraging the dog to bark. Dogs are little warning machines, they love to alert you when something is outside. As your dog goes from puppy to adult, that natural instinct to warn you of intruders increases. It’s advisable to teach the command “quiet” from the start using redirection techniques. In some cases teaching a dog to “bark” (or speak) on command also teaches them not to bark. I would consult a professional for this one. Fact: dogs actually thinks they’re the ones that caused the postman to go away? 6. Letting a puppy lick your face excessively. Kinda like giving you their paw… It might be cute but if you encourage it -too much- it can become an obsession problem. Your puppy will want to lick every hand and face of every person you know, and every person you don’t know. 7. Letting a puppy play with your old clothing or other household items. Your dog can’t distinguish between old and new, your child’s stuffed animal, kitchen utensils, old shoes or slippers etc. To be clear to your puppy, they should only have “dog toys” to play with. 8. Just before a walk, getting your dog all excited and saying, “You wanna go for a walk?” Over-time your dog will become too excited and hard to control. Doing this can also cause other behavioral issues. 9. Allowing them to jump in the pool without being asked. It is important to teach a dog where the steps are, so if they fall or jump in, they’ll know how to get out. It’s always a good idea to teach good pool side manners from the start. 10. Teasing them with a lazer pointer, flashlight or garden hose; read my story Warning About Laser Pointers. I also don’t recommend using the garden hose as a spray gamey toy, this can turn into a obsessive problem and can lead to sprinkler destroying. 11. Letting them pull you towards other dogs: Yes you need to socialize them with other dogs at a young age, but if you allow them to pull you towards dogs while on lead, you’re just teaching them to pull you!. There is a proper leash walking and dog greeting formula to follow. My job brings me up close and personal with many different dogs, and some very aggressive ones. You might think I would occasionally get bit, right? Well, I really don’t. In the past 30-years, my clients dogs have only claimed two, what I call, small bites and a few nips that have barely broken the skin. Even when I trained police dogs, I never got bit. There are a few reasons I don’t get bit, one is I don’t like getting bit (imagine that); I’m able to read a dogs intention’s; I do the obvious thing and avoid putting a dog into an aggressive state, and besides I thought the name of the game was not to get bit, if I did get bit -a lot- wouldn’t I be in the wrong profession? A few trainers like seeing the dog being aggressive, or they deliberately put the dog into an aggressive state. Maybe they do this because they think seeing the behavior will change the advice they give, or maybe they do it because it makes for good television? Well, I got news for them, in the majority of aggressive cases, they don’t need to see the aggression. Just a few questions to the owner will usually tell a behaviorist what classification of aggression it is. There are several: fear, redirected, resource, territorial, dog, barrier, restrictive, dominance and a few others. I’ll believe an owner when they tell me their dog has bitten a couple of people, I don’t need them to show me, but some dog owners must think that’s what I want to see. I recall one client, who let their 95-pound German Shepherd in from the backyard, before I could yell, “Don’t let the dog in!” actually I did yell to the owner- but she couldn’t hear me over her dog charging, growling at full speed down the hardwood floor hallway, the dog then lunged up at me with an open mouth. So, I stuck my note binder (which I always carry) into the dogs mouth and luckily the owner was able to grab him and put him outside. Thank goodness for my experience being an agitator and catching police dogs on the wrap (arm protection). If I’m going to rehabilitate an aggressive dog, It’s important to have the dog trust me and listen to me. Once I can do that, I can get them to trust and like other people. So after speaking with the owner for about 30 minutes at the dining room table, I asked her to let the dog back in, and this time he didn’t try to bite me, because I changed his perception of who I was. I also didn’t get in his face, which doesn’t seem fair to do anyway. Even though the dog didn’t bite people after that, there is still a trust issue for dogs that have a history of biting. The owners must be very aware of any changes in their dog’s behavior for the rest of it’s life, especially when it gets older and crankier. I can’t blame the German Shepherd coming after me, to him, he was protecting the family from a stranger, although it’s not appropriate for them to behave that way, and behaving that way could get a dog put down. The owner needs to take responsibility, letting her -known- aggressive dog, a German Shepherd inside the house right after a stranger enters (not good). Owners need to educate themselves before getting certain breeds, and make sure the puppy has *specific exposure and socialization to adults, children and and other dogs. By using my experience, body language and creative thinking, I give dogs less of a reason to bit me. In many cases, dogs won’t display the bad behaviors the owner wants us to see anyway. However, all the proper body language in the world doesn’t translate too well with really aggressive dogs, like the German Shepherd example above, but thankfully the note binder was there to make the translation perfectly clear. If you have a dog that is showing signs of any type of aggression, it is a good idea to call a dog friendly dog trainer, sooner than later. NOTE: Inside the car, never praise or pat them in a nurturing, “oh everything is alright, don’t be scared” kinda way. Step 2: When you notice the dog is getting more comfortable in the car, you can tell by how much they play with the toy you’re using, and/or the treats you’re having them earn, then start the engine and continue the tease play and going in and out of the car a few times. Tug of war, now just called Tug or the tug game is one of those misinterpreted dog/human games that doesn’t get experienced by many dogs because of the aggressive perception of the game. Many animal professionals tell you not to play tug of war because it’s just easier to tell you not to play, rather than teaching you how to teach your dog to play right. Plus they still believe in the “old theories” of dog behavior, the theories about you must be pack leader , always being the dominant one. Under those “Pack” rules, you are in competition with your dog for everything and you must not allow them to “win” because they will think you’re weak, and then assume the position of “Pack leader”. These teachings couldn’t be farther from the truth. It’s probably one of the best games you can play with a dog. Your dog is your team-mate and not your competitor, you are working together for a common goal. Your dog instinctively knows to practice as much as possible play fighting and tugging on things, so that when the real thing happens, like taking down prey, they’re prepared. We go to the gym- dogs play fight. When tugging on the same piece of meat from a killed prey, they are tugging to tear the meat apart, so they both can swallow smaller pieces, and not so much a battle of who gets the food or biggest piece. Dogs see it as both of you against the toy and not against each other. Talk about lost in translation; they must really be confused when they’re corrected (or deprived) of things, when they are really just trying to play, practice and work together. 1. Helps satisfy their predatory needs i.e. seek, chase grab, tear etc. 2. It re-directs their biting behavior from your body and clothes to the tug toy. 3. Helps you build better communication skills with them. 4. Excellent energy outlet for them both mentally and physically. 5. Another great way to spend quality training and play time with them. 6. Gives you another reward source when they perform tasks. 7. Helps keep their teeth and gums in good health. However, every game has a set of rules that must be followed, not because of dominance- but because you don’t want a dog making the rules. During my lessons, I teach people how to teach their dog to properly and safely play tug games, even if their dog doesn’t show an interest in toys. If you play the tug game properly, you’ll keep them from getting the wrong idea and developing control/ behavioral problems. 1) First, teach your dog to do some basic commands, sit, stay, down etc. Obedience training is the best doorway of communication to every activity you do with your dog. 2) Make sure your dog has a really good fetch, bringing their toys consistently back to you. 3) Ask them to get the toy or have them do a task to earn it. 4) Teach them they must wait until their toy is dropped, tossed or presented to them. 5) Correctly teach a “release” command, such as: “Out”,” Give”, “Drop” “Ta” etc. 6) The consequences for unacceptable behavior, i.e. jumping at you, biting you, not releasing when asked, is the game stops, or they are given a “time out”. 7) It’s ok for them to “win” sometimes, just remember you’re in control how the game is played. Try to start and end the game when you want. Not because we want our dogs knowing who’s “Top Dog” , we just don’t want to get hurt by their sharp teeth and we don’t want them waking us up at 3 in the morning wanting to play. It bothers me that trainers, even today equate everything a dog does as dominance or submissive reason, when it’s really just a dog that was never taught the “rules” or an owner who doesn’t know how to teach them. Where the tug game gets negative attention is if the dog has the toy and the owner tries to take it, and the dog growls or snaps. That behavior wasn’t or isn’t caused by tug games, it’s caused by the predatory nature of dogs to guard precious resources aka: “Resource Guarding” or “Possession Aggression”. These dogs value the item too much once they get it and they want to keep it for themselves. Somewhere in the past, the owners encouraged or allowed this bad behavior to go on without modifying it. Don’t worry, the problem can be fixed with the right knowledge, just call your local dog friendly trainer, or visit my “Programs Available” page to find out how I can help you. Is a technique I’ve develop to help rehabilitate dogs with many different kinds of issues, submissivness, fear, aggression, phobias, to name a few. It’s effective in giving dogs confidence in situations where there was none. When a dog becomes submissive, nervous or fearful of something, we often humanize their thoughts (most of the time we’re wrong) and comfort them if we “think” they’re feeling hurtful emotions, but we’re doing more harm than good. Why? Dogs don’t hold each other or pat each other like we do, or talk to them telling them everything will be okay. If dogs have fear of thunder, fireworks, people or dogs, a big part of the blame is the comforting or just “bad timing reinforcement” done by their owners. Yes, initially they may have reacted negatively to those unfamiliar things, but it’s how the owner reacts to their reactions is the where the problem begins. Applying this technique works best if have a strong relationship with your dog and your dog responds to several obedience commands. Rather than me explaining how the technique is done, let me show you (video below) First, I need to set up the video clip you’ll be watching. The first dog you’ll see is Duncan, a 4-month old German Shepherd, he gets terribly car sick. The car doesn’t have to move for him to start drooling excessively. NOTE: These clips are not a “How to” cure your dog of car sickness or any problems you’ll see, it’s an example of how to use re-direction tease play when, a) You see your dog react negatively to strange noises or situations, or b) Using it as part of the rehabilitation process for lots of behavioural issues. The second dog you’ll see is Chulo, a 6-month old white German Shepherd. He’s socialized with other familiar dogs in semi-large groups, but not around strange dogs or at this particular dog park. I noticed straight away he would snap at dogs if they came up behind him, especially the older more assertive (friendly) dogs. This technique will help him be more tolerant when dogs suddenly come up to him. The Third dog is Freda, she has a very sweet face, but has a few aggressive problems, she’s a 4-month old Kelpi mix who goes ballistic, screaming, biting, scratching and urinating if you suddenly try to restrict her movement either by holding her collar or just holding her. She will need a lot of re-direction tease play in many different scenarios. Since I’m living in Freda’s house, while her owners are on holiday (a training program I offer), I can focus a lot on using “tease play” to help cure her of – what I call “restrictive phobia”. Since I’ve been working on this blog, filming and working on Freda’s restrictive phobia problem, we had a break through, I’ve added a clip of Freda letting me grind her nails. Note: You’ll notice I never say anything or pet (praise) the dogs I’m rehabilitating (Think “Dog whispering”). “Patting” is interpreted more as praise or approval of thoughts and feelings (emotions), vs. if using food which reinforcement more what they just did. Emotional “Hello’s and Goodbye’s” are when you greet your dog or say goodbye to your dog in an excited way. Following the advice is not going to be easy, because you have to adjust to your dogs needs and learning capacity, but if you can follow the advice then you are a true dog person- putting your dogs needs- ahead of your own. Back to my story. I tested the spray collars and thought they were great! The spray doesn’t just directly affect one of a dog’s senses (like the shock does) but four of them, which is why they are more effective than the shock collars. When sprayed, they can see it (it’s a mist) the can feel it (under the chin) they can hear it (pssst!) and they can smell it (citronella). The remote collar set-up worked great for stopping the more difficult behaviors, like digging, chewing, jumping on the other side of the door (to name a few). There are 3 buttons on the hand-held remote, and when you press the first button, it emits a double beep sound on the collar. The second button emits a short duration of spray (1 second). The third button emits a longer duration of spray (2 seconds). I thought this is great; you can vary your correction or re-direction by warning them first with the beep sound and because many dogs are sensitive to sound, the beep was the correction, so you didn’t need to spray. If the dog didn’t respond to the beep, the short and longer spray could be used. Those dogs quickly learn the beep was a warning to the more startling spray correction, then after a few beep and spray experiences, the “beep” became the correction. The collars are only part of the behavior modification process, I also incorporated a re-direction reward after the beep or spray marker. I also made sure the dogs had plenty of time to be dogs and get exercised and understand at least five obedience commands, because a tired dog is less likely to display behavioral problems and a smart dog learns not only what to do, but what they’re not supposed to do. After my evaluation input, the company (Premier Pet Products) wrote in the instruction book to use the beep as a positive sound, letting the dog know that when they hear the beep it’s a good thing. There was also no mention of the redirection follow through reward, which to me is the most important part. When I read that in the instruction manual, I knew the testing from other trainers who gave input was not done properly nor did they read or take my input seriously. Too bad, because many dogs get sprayed when there is no need, and what a waste of the proper use for the beep sound. I haven’t read their instruction booklet in several years, I wonder if changes were made? Today, I rarely use these collars but it’s nice to have them on hand when I run into the more difficult cases. I can see however, where a few people can benefit from using them, as long as they understand the right way and take all the other steps needed. If you ever purchase a remote spray collar, I don’t recommend using the beep as a reward marker as per instructions. That’s what a “Clicker” or the word “Good” is for. As an animal behaviorist, I understand that there are direct and indirect “causes” of behavioral problems. I also understand that there are direct and indirect “cures” for behavioral problems. 1. Emotional hello’s and goodbye’s: This one practice by the owner is a direct and indirect cause for many of a dog’s behavioral issues. I’ve posted a teaser blog; If you’d like the whole post, you’ll need to contact me. 2. Having no obedience on your dog: Without you or your dog having the knowledge to execute basic commands or solve problems, you are much more likely to have a dog with behavioral issues. 3. Allowing a young dog to sleep in your bed: This can in-directly cause behavioral issues like excessive chewing, digging, barking, etc. For the first year or 2 puppies or young dogs should have their own sleeping spot next to the bed. If after that, they dont have any behavioral issues, you can let sleep in the bed with you. Or not. 4. Bad timing: With dog training or behavior modification, timing is everything. By having -bad timing- can cause a dog to be confused and develop behavioral issues. 5. Using the wrong training methods or training equipment can indirectly cause behavioral issues. 1. Practicing no emotional hello’s and goodbye’s: Waiting 3-5 minutes before saying “Hi” to your dog is an effective way to help cure your dog’s behavioral issues. Not saying “hi” may sound mean but after you read my blog “Emotional hellos and goodbyes”, you may think differently. I will be posting that one soon. 2. Obedience training: Training has both a direct and indirect effect on curing a dogs behavioral issues. There’s nothing more to say. Every dog should understand at least 5 basic and 3 advanced commands, on and off leash, around distractions, with or without treats. If done correctly obedience training not only teaches a dog what to do, but it also teaches them and helps them learn what not to do. 3. Sometimes doing the above won’t stop a dog’s behavior problem as some dogs need a more direct approach. With any behavioral issue the trick is to anticipate the behavior to happen or to re-create/ set-up the dog to repeat the bad behavior, BUT the trick is to counter-condition the behavior before it happens. 4. Timing is everything when changing a dog’s behavior. If you know how dogs think and learn, if you are quick to “mark” good behavior, ignore unwanted behavior, you can reverse behavior problems. Shock collars are not always the quick fix as people think, dog owners don’t understand how to use them, they usually don’t cure the problem, the dog gets the worst of it and it turns out to be a big waste of time and money. In other Countries they’re called Static collars, because truly its more of a static shock, like when touching something after folding clothes straight out of the dryer, or rubbing your feet on the carpet. If you’ve ever touched a 9 volt battery to your tongue, you know the feeling. That’s why I’m not totally against these collars, especially if it will keep the dog from being sent to the shelter or from getting hit by a car. However, I would only recommend them if all other options have been exhausted and with the help of a professional knowledgeable trainer. I would first recommend trying a citronella spray collar, they are actually more effective than the static collars, and much more user friendly. 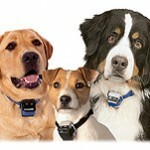 But before we use any collar, we need to figure out what the direct and indirect causes are for the dogs bad behavior. You can’t be directly or indirectly encouraging, allowing or causing a behavior, then placing some device on the dog and think they magically understands your wishes. This is very confusing and unfair to the dog. The more you learn about proper behavior modification solutions, the less you need to resort to these kinds of Techniques. If you would like to be notified when I post new training information, enter just your email address. You can also leave a comment below.